It looks like Fortnite might be heading to China. A tweet by Epic posted early this morning suggests that the company’s smash hit could be expanding into one of the biggest gaming markets in the world. Here’s how to complete the Fortnite week 9 challenges. 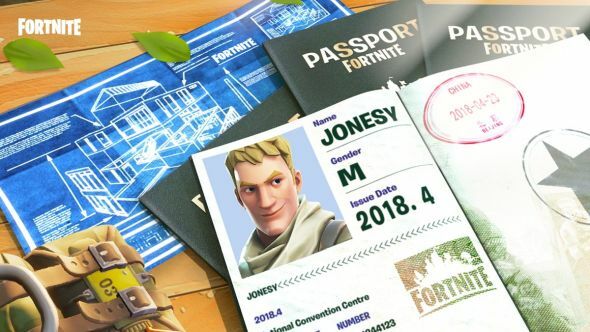 The tweet shows a passport, apparently belonging to Save the World character Jonesy, with a Chinese border control stamp dated 2018-04-23. For those of you keeping score at home, that’s April 23, or this coming Monday, suggesting Fortnite’s Chinese release might not be far off. The picture’s caption simply reads “The Battle Bus is taking off! Destination, China,” which is a pretty big clue. That’s pretty much all we know at this point, but there are some interesting things to consider. It’s a bit of a no-brainer that Epic would try out the Chinese market – not only has Save the World seen plenty of Lunar New Year-style cosmetics this year, but the overwhelming success of fellow battle royale PUBG in China is surely encouraging for Epic. It’s not apparent whether the company are aiming to bring one or both of their game modes to the market, but it’s interesting to consider that Chinese authorities recently issued a statement discouraging devs from making battle royale games, as they don’t conform to core Chinese values. That said, Chinese publishing giant Tencent own 40% of Epic Games, and it’s very likely that they’ll be responsible for bringing Fortnite to China. Given that the very same company also helped bring PUBG, which is a much more ostensibly violent game, to the country, it’s very possible that Fortnite Battle Royale will soon be available in China.